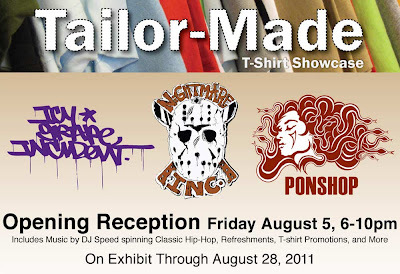 PONSHOP will be hosting the opening reception for “Tailor-Made: T-shirt Showcase” as August’s “First Friday” event. This exhibition will feature new screen-printed shirt designs from PONSHOP, Nightmare Inc., and Icy Grape Incident Clothing. The gallery will also exhibit the original artwork used to produce the clothing graphics. PONSHOP’s latest art tees for men, women and children feature owner Gabriel Pons’s signature graphics derived from his original paintings. Nightmare Inc. is a local clothing brand started in 2008 by Massaponax high school senior Ryan Payne. With inspiration from horror films, Nightmare Inc. incorporates iconic imagery into their unique clothing graphics. Nightmare Inc.’s artist Austin Collins has collaborated with PONSHOP on a special T-shirt graphic to be sold exclusively at PONSHOP. August marks the one-year anniversary of Icy Grape Incident Clothing Company. Founded by seven-cities artist/designer Tony Sementelli, Icy Grape Incident’s goal is to produce high quality clothing with original graffiti inspired artwork. They will be releasing a new colorway at the show, designed exclusively for the August event and sold only at the PONSHOP. The evening’s event will include music, refreshments and t-shirt giveaways. Music will be provided by DJ Speed on the turntables spinning classic Hip-Hop. August’s exhibit also includes works by a collection of many local fine artists including Rob Landeck, Adam Desio, Nathan Webster and Nicholas Candela. In addition, the gallery will include works from featured PONSHOP artists Katy Wiedemann (Providence, RI), Joshua Barber (Richmond,VA) and Ginger Huebner (Asheville, NC). PONSHOP’s gallery exhibits over thirty artists making all handmade items from jewelry and clothing to artisan soaps and accessories.